Newly built custom home, fully furnished with a large, beautiful open floor plan. A 40 foot deck with state of the art glass balustrades overlooking a gorgeous, spring fed pond stocked with Large Mouth Bass, Pickerel and an assortment of other fish. This is a quiet retreat setting with a private dock to swim or fish off. A full walkout basement that is directly on a sandy beach. Enjoy this quiet, clean body of water with no motor boats or jet skis allowed to take away from the peaceful setting. A good size front and back yard with grass. A quiet dead end street. Great for kids! Cape Cod is a quick 10 minute ride on a back road to the Bourne Bridge. Plymouth Rock, Plymouth Plantation and The Mayflower just minutes away. My name is Steve and I live with my wife and 3 kids in Braintree. My wife is a teacher and I am a contractor. We were looking for a summer home after staying with friends at their summer house in Plymouth. My oldest daughter was a toddler and thought it would be a great place to have a summer home for our new and growing family. Plymouth has everything and is very convenient to the Cape and Boston so we thought it would be perfect for us. I found this property after searching many, many properties. I fell in love with the location and the spring fed, clean swimmable pond. At this time the house was a small ranch. As our family grew to #2 and #3 we realized we would have to sell or make this house larger. We love this area so much, in 2008 I decided to raze the small ranch and build a completely new house with a full walkout basement and 2 floors above. I designed this house to take in the panoramic views and the nature abound. I also had in mind the countless large family gathering we have at the house. I made a large open floor plan with all glass overlooking the water and a huge deck. We still use this as a summer house but I went a 'little crazy' when building so we have to rent out a few weeks to help pay the bills. We are happy to see other families share our 'little gem' and have many vacationers request to come back multiple times. We had a fantastic vacation at this property. 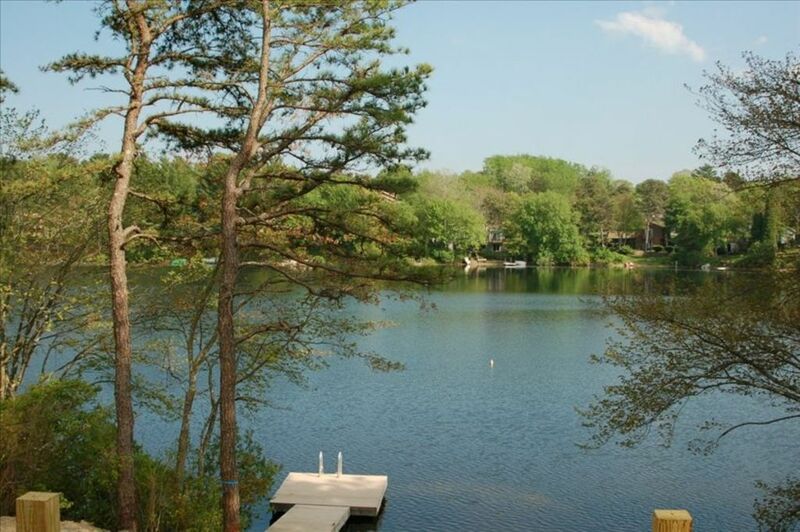 Located on a private pond, it is quiet, but within easy reach of Plymouth and all that the cape has to offer. Our days were spent either relaxing at the house and swimming in the warm fresh water pond - which has a great raft for diving and a small private sand beach - or off exploring Cape Cod. The house is clean, stocked with all of the essentials for a self sufficient stay, and spacious. Air conditioning was a nice perk for warm nights. The three floor set up was great, as it allowed everyone the room to either find their own space, or gather comfotably for meals, and games together. It was a beautiful house. We all had a great time there. Fully worth for the price. Kitchen was filled with all the things needed for cooking, baking & BBQ. There was a nice pond behind the house filled with fish. My friends stopped counting how many fish they caught after a little while. :) There was a canoe & a kayak, so that you can spend lot of time in the pond itself. There are many beautiful beaches around that you can enjoy. We had a wonderful week at the pond house in Plymouth. Grandparents, parents and five children had such a great time swimming, kayaking, fishing and enjoying the beautiful house. There was plenty of room for all and the yard was very well maintained and perfect for the kids. We had a problem with the microwave and the owner stopped by and fixed the problem. The setting is perfect and peaceful and yet not more than 15 or 20 minutes from the beach and other attractions. I would highly recommend this listing for any age group-especially nice for families with kids. We loved it so much we have already booked again for next summer!